I must admit I judged this book by its cover. While browsing in a secondhand book shop something made me pull out the battered Penguin Classic. I had never heard of Robert Graves, his rather surly image is on the back cover as you can see, and I knew nothing of the story, but I bought it anyway. What I love about this book is its story, the story of the book, as well as the story in the pages of the book. On the inside cover is written in ink “A Happy New Year, Pegg. Just a little something to read on the tram. I hope you enjoy it. The gloves are lovely, many thanks, Love Jacque”. From the publication date we can assume if the book was purchased new as a gift that the dedication was written around 1947. There is something so wonderful about that, and as I read the story I imagined ‘Pegg’ reading it on the tram some 70 years ago. So, now we come to the story itself. I really enjoyed this novel, it was based around the conflict between a brother and sister, which centers around the contested ownership of a stamp album and a particular stamp which give the novel its title. The story weaves together everything which one would assume was simply mentioned in passing to flesh out a scene, and any potential red herrings are pointed out if they are not relevant later. This makes for an interesting read, where many of the stylistic elements of the novel are referred to or explained as they occur. In this way it is a little similar to ‘If on a Winter’s Night a Traveller’ by Italo Calvino, though certainly it has a much stronger central narrative than Calvino’s unusual book (Which I may not review, as I read it some months ago, but I highly recommend). Overall the characters are vivid and I became quite involved in the dispute, silently cheering on one sibling over the other. This vividness is probably owing to the quite small cast of characters, and a series of supporting characters who reappear as needed throughout the book. This is a technique used very effectively by Émile Zola in ‘Thérèse Raquin‘ which made this novel easily adapted for the stage, and contributed to the claustrophobic feeling of the book. 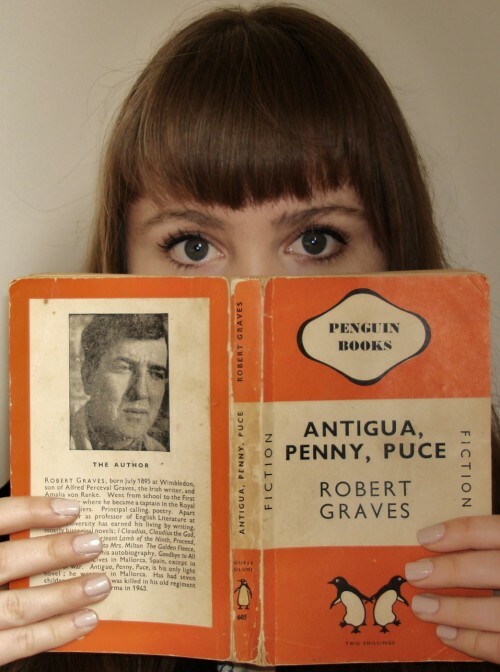 In the case of ‘Antigua, Penny, Puce’ it reinforced the interlinking nature of the plot and of families and friendships. The only other thing I will add is that, as an Australian I am always very interested to see how Australians are portrayed in novels, and this book had some interesting character assessments and other references to what Australian people are like. This provided a nice contrast (in my mind) to another book I recently read ‘The Getting of Wisdom’, which is interesting as an Australian perspective on what Australia was ‘really’ like in a slightly earlier time period. I am beginning to amass a little list of books from 1900/1940s which use Australians as plot devices, I might share it one day soon. Amusing stuff.